Earlier in 2013 Norman Baker, the Transport Minister, announced the £30 million Cycle City Ambition Grant. On the 15th February guidance on applications was published for the 28 cities eligible to apply. The guidance document is an amazing publication and I believe it should be a model for how transport funding is allocated. In the introduction along the report states that across OECD members there are “ambitions for cycling are growing to move cycling to the mainstream offering it as a realistic choice for quick, reliable and convenient short journeys within cities”. It supports the idea that we are “facing declining levels of physical activity together with a range of public health impacts” and that these are “influenced in part by car dependency and sedentary lifestyles” and that there is “a significant opportunity to improve integration of transport and health”. It identifies that “mainstreaming cycling and walking offers a cost effective way to relieve congestion and improve the quality of life within the city”. These are big statements and idea’s that I fully support however they are not backed up by the levels of investment required. There are 28 cities eligible for funding however there will be a maximum of 3 Cycle City Ambition Grants awarded, the DfT expect to “provide funding to successful applicants of the equivalent of around £10 per head of population over 2 years”, they also “expect a commitment to longer-term support from the cities themselves”. The Netherlands is recognised as one of the world leaders in cycling, the Dutch are estimated to spend £30-£40 per head on an ongoing annual basis. The Cycle City Ambition Grants will provide £10 per head for 3 cities for 2 years, the Dutch spend £30 per head in all places every year and has done for a long time. The list of benefits of cycling given in the document is impressive, it outlines the case for investing in cycling really well. a.Unlocking capacity on road and public transport networks through large scale shifts to more active commuting patterns. b.Better linked communities enabling more choice for getting around within and between neighbourhoods. It is very clear from the guidance that any new cycle infrastructure must be “fit for purpose and designed to a high standard as set out in the Cycle Infrastructure Design Guidance” and a link is given to LTN2-08. This is excellent, all too frequently local authorities install sub standard cycle infrastructure pointing out that LTN2-08 is just guidance (even though LTN2-08 really is the bare minimum we should be aiming for). This clear advise that this investment in cycle infrastructure needs to adhere to best practice. The guidance points to the Manual for Streets publications and draws particular attention to the hierarchy of users. I like this! So, will my home city of Sheffield be applying for this funding? I’m not so sure. At a recent Fair Deal For Sheffield event I spoke to Leigh Bramall who is Chair of the Highways Commitee at Sheffield City Council. We spoke about the various grants available to local authorities for cycling, he put forward the idea that Sheffield City Council were cutting jobs in the Highways department and that they wouldn’t be able to provide project support for large cycling infrastructure projects with current/future levels of staffing. 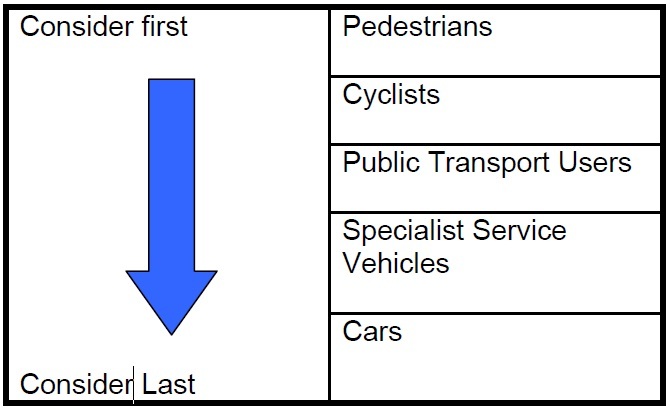 In response I’d like to suggest that they allocate resources in line with the Hierarchy of Users diagram in the manual for streets with pedestrian and cyclist projects taking priority over all others. I look forward to reading the proposals from the cities for this funding. 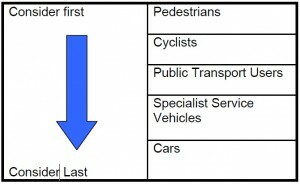 This entry was posted in cycling, infrastructure, parliament on February 27, 2013 by Matt.